Contributions by R. Artzy, R.D. Baker, L. Beneteau, L. Berardi, D. Betten, A. Beutelspacher, P. Biondi, A. Bonisoli, W. Cherowitzo, J.R. Clay, C.J. Colbourn, F. de Clerck, M.J. de Resmini, M. de Salvo, G.L. Ebert, F. Eugeni, R. Frank, C.W.L. Garner, H. Gevaert, D. Ghinelli Smit, G. Hanssens, A. Herzer, S. Innamorati, J.D. Key, N. Knarr, F. Knüppel, H.-J. Kroll, P. Lancellotti, J.A. Lester, J.W. Lorimer, S. Löwe, H. Mäurer, E. Mayer, E. Mendelsohn, K. Metsch, R. Meyer, R. Migliorato, J. Misfeld, W. Nolte, D. Olanda, A. Pasini, S.E. Payne, C. Pellegrino, J. Pfalzgraf, G. Pirillo, R. Procesi Ciampi, L. Puccio, S. Rajola, D. Remus, A. Rosa, R. Rota, H.-P. Seidel, D. Senato, J. Siemons, S.H. Spartalis, H. Szambien, G. Tallini, J.A. Thas, V.D. Tonchev, H. van Maldeghem, A.M. Venezia, T. Vougiouklis, K.E. Wolff, N. Zagaglia Salvi, C. Zanella, P.-H. Zieschang, E. Zizioli. Recent developments in all aspects of combinatorial and incidence geometry are covered in this volume, including their links with the foundations of geometry, graph theory and algebraic structures, and the applications to coding theory and computer science. Topics covered include Galois geometries, blocking sets, affine and projective planes, incidence structures and their automorphism groups. Matroids, graph theory and designs are also treated, along with weak algebraic structures such as near-rings, near-fields, quasi-groups, loops, hypergroups etc., and permutation sets and groups. The vitality of combinatorics today lies in its important interactions with computer science. The problems which arise are of a varied nature and suitable techniques to deal with them have to be devised for each situation; one of the special features of combinatorics is the often sporadic nature of solutions, stemming from its links with number theory. 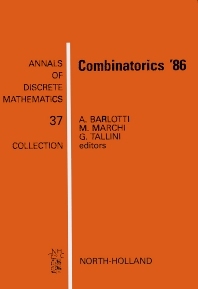 The branches of combinatorics are many and various, and all of them are represented in the 56 papers in this volume.